A popular strategy with savvy players in the global market for viral inactivation trying to bolster their positions is the thrust on acquisitions. Besides, they are also investing heavily in research and development to come up with new products in response to various requirements for treating diseases. A dominant players in the market, namely Merck & Co., Inc., is seen to have a stronghold across nations worldwide. At the forefront of driving growth in the global market for viral inactivation is the rising approvals of new drugs, rules pertaining to viral safety of biologics, and the proliferation of the biologics and biosimilars industry. Besides, the growing instances of various infectious diseases and growing application of biosimilars therapeutic treatment for a range of diseases are also positively impacting the market. Proving counterproductive to the market, on the downside, is the high costs involved in developing and manufacturing biologics and biosimilars products and also the high price of equipment for viral inactivation. However, new types of viruses needing vaccinations to be developed against them spells new opportunities for the market. 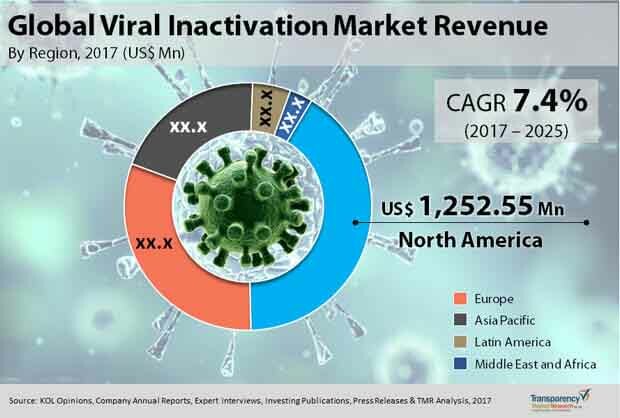 A report by Transparency Market Research predicts the global viral inactivation market to expand at a healthy 7.4% CAGR from 2017 to 2025 to become worth US$5.736 bn by 2025 from US$3.05 bn in 2016. Depending upon the type of method, the global viral inactivation market can be divided segmented into chemical, radiation, and others such as pasteurization and dry and moist heat treatment. Of them, the chemical method leads the market with maximum share as it is a robust and effective method of inactivation of different types of viruses. It is also cost-effective, safe, and brings about a high degree of purity of sample. The chemical method is further sub-segmented into solvent detergent method, use of alkylating agent method, and pH concentration method. The solvent detergent method, among them, is projected to account for largest market share by the end of 2025. In terms of growth rate, however, the radiation method for viral inactivation is expected to outpace all others on account of the rising adoption of the method in blood centers in developed nations. The UV radiation method has been tested and developed for viral inactivation of blood and blood components at blood centers and at commercial manufacturing facilities. From a geographical standpoint, North America currently holds a sway over the global market on account of a robust biopharmaceutical industry, swift uptake of newer viral inactivation methodologies, rising demand for blood and blood components for transfusion therapy, and strict regulatory guidelines for the viral safety of biologics products. By growing at a CAGR of 7.2% in the forecast period, the market will likely become worth US$2.31 bn by 2025. However, North America is slated to lose some of its market share to Asia Pacific, which is predicted to expand at maximum pace. The report by TMR projects the viral inactivation market in the region to clock a CAGR of 7.9% from 2017 to 2025. The region’s growth will be primarily powered by countries of South Korea, Japan, and Australia which have strict rules in place for purity of biologics and biosimilars products and also by China, India, and Malaysia having a booming biopharmaceutical industry. Some of the dominant players in the global market for viral inactivation are Shandong Weigao Group Medical Polymer Company Limited, Sartorius AG, Cerus Corporation, Macopharma SA, and Terumo BCT, Inc.
As per the report, the global viral inactivation market could see a segmentation according to end user, application, and method. Bringing about a high level of purity of samples, the chemical method segment is projected to account for a larger share in the market. This report is viewed as a near-accurate guideline for companies looking to venture into the global viral activation market or cement their current positions in the industry. It offers a complete account of various aspects and factors deemed significant for ensuring a strong growth in the market. The world viral inactivation market is foreseen to gain strength due to certain factors such as the proliferation of biosimilars and biologics industries, regulations laid down that pertain to the viral safety of biologics, and increasing approvals of new drugs. The market could be positively impacted by the increasing application of biosimilars therapeutic treatment and rising incidence of a range of infectious diseases. However, the growth of the market is predicted to see a fall in the coming years due to the expensive price of viral inactivation equipment and extortionate costs involved in the manufacture and development of biosimilars and biologics products. Nonetheless, the world viral inactivation market is prognosticated to witness the rise of promising growth prospects in the foreseeable future on account of the birth of new types of viruses which need to be urgently countered with the help of effective vaccinations. In the international viral inactivation market, industry players could find favorable opportunities taking shape on the back of North America’s highly competitive biopharmaceutical industry. From a regional perspective, this region is expected to exhibit dominance in the market because of the rise of more growth factors such as stringent regulatory norms for the viral safety of biologics products and the swelling demand for blood and blood components required for transfusion therapy. The rapid adoption of latest viral inactivation techniques could also expand the growth in North America. Nevertheless, Asia Pacific could steal the glory from North America while rising at a quicker CAGR during the forecast period 2017-2025. The boom witnessed in the biopharmaceutical industry of Malaysia, India, and China could help the region to showcase its prominence in the international viral inactivation market. Yet, there could be other countries such as Australia, Japan, and South Korea supporting the regional growth with their tight regulations pertaining to the purity of biosimilars and biologics products. Some of the prominent players of the worldwide viral inactivation market could be Cerus Corporation, Sartorius AG, and Shandong Weigao Group Medical Polymer Company Limited. Each player profiled in the report is evaluated in a comprehensive and meticulous manner to provide a clear view of business tactics, competitive scenarios, and the nature of the vendor landscape likely to take shape in the near future.